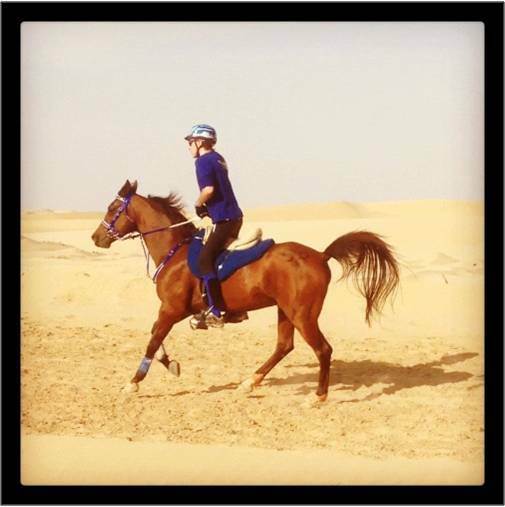 This was my first time visiting the middle east and was very kindly riding one of Anzac Mehmood’s horses in the Presidents Cup for Juniors 120km 2* ride at Bou Thib near Abu Dhabi. I had met my horse Ralvan Legacy the day before the ride. He was a beautiful horse very nicely put together with an effortless canter. He is only 8 years old and this would be his first 120km race. The tactics were to ride off the leaders’ pace but still bowl along at around 21-22kmph. The day of the race, we started as the sun rose alongside 68 starters. It was cool at about 10 degrees but soon warmed to peak at 28 degrees at midday. The start was relatively relaxed and drama free, all the horses are used to cantering with others around and I didn’t see any out of control. The same cannot be said for the crew cars who sped off at what seemed like a hundred miles an hour! It was like riding down the middle of a rather sandy M6 at this point! The tracks are all man made and the sand varies from very hard areas to very soft. The key was to aim for the depth in the middle. I rode with a Belgium girl who was also riding for Anzac. We were followed by two crew cars and Anzac’s car. The crews leapfrogged each other to slosh at 400 yard intervals. At first, Legacy found the crews very spooky and broke stride every time he saw them. So as the day went by, we worked on this with the help of some blinkers. During the midday heat, the horses were sloshed even more, maybe at 200 yard intervals. People have asked ‘did you not think it was hot or get tired?’ The answer is that concentrating on my pace and getting the next slosh meant I never really had time to think god it’s hot! All the vet gates ran very smoothly, presenting under 3 mins each time. We galloped in to finish 23rd at a speed of 20.58kmph. The winner of the race was Khalifa Ali Khalfan Al Jahouri riding Vasco with an average speed of 26.9kmph. It was a fantastic first experience of riding in the desert. Thanks to Anzac for letting me ride such a beautiful horse.